Social security refers to legislation enacted by a government to promote the welfare of its population. The provision of social security by a government to its citizens is included in Article 22 of the Universal Declaration of Human Rights. What a particular government does to promote its citizens’ welfare varies widely by country. Many European nations, such as France, have broad social security programs designed to help families, the impoverished, and the elderly. In the United States, social security refers to the social insurance program funded through payroll taxes that helps Americans save for retirement. Social security is largely credited with significantly reducing poverty rates among the elderly. However, the structure of the social security system has put the entire program into serious financial distress. New Deal: The New Deal was a series of economic programs implemented in the United States between 1933 and 1936. They involved presidential executive orders or laws passed by Congress during the first term of President Franklin D. Roosevelt. Social Security: A system whereby the state either through general or specific taxation provides various benefits to help ensure the well-being of its citizens. Social Security Act: The Social Security Act, now codified as 42 U.S.C. ch.7, was a legislative act which created the social security system in the United States. Social security refers to legislation enacted by a government to promote the welfare of its population. Most countries establish some set of basic provisions considered necessary for survival, enabling programs such as funding for poverty-stricken elderly people who cannot afford their own healthcare or providing food for families that are too poor to purchase their own. Cultures have different standards for what governments should provide to citizens who cannot provide for themselves and different standards for what is considered necessary for survival. European nations generally have more robust programs to assist needy citizens than the United States. France’s social security programs provide a good point of comparison for the American context. France’s social security program is divided into four branches for four different types of support: support for the ill, support for people who have sustained accidents at work, support for families, and support for the elderly. These institutions are collectively referred to as Sécurité sociale, or la sécu. Some in America have derided France’s social security system as socialist. It is true that the government provides more for its citizens than the United States, but most French citizens simply expect these provisions as a part of a government’s obligations to its citizens. Social security in the United States refers to the federal Old- Age, Survivors, and Disability Insurance (OASDI) program. OASDI was established under the original Social Security Act, passed in 1935. Since then, multiple amendments have been added to the legislation, but all of them address the government’s obligation to elderly individuals who have entered retirement. Social security is a social insurance program that is funded primarily through payroll taxes, or taxes taken out of an employee’s pay each pay period. Tax deposits are formally entrusted to funds that maintain the money and distribute allowances to qualifying elders. The population to whom social security programs are addressed demonstrates how anomalous the meaning of social security is in the United States. 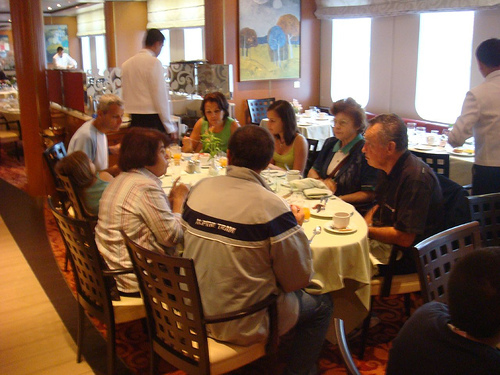 La sécu and other social security programs provide welfare benefits for all of a country’s residents while social security in the United States assists the nation’s elderly citizens. Prior to 1935 and the passage of the Social Security Act, social security did not exist in the United States. Bear in mind that the passage of the Social Security Act occurred in the heart of the Great Depression, which was the most serious economic downturn ever experienced in the United States. The stock market crash of 1929 sparked the depression and destroyed the value of most Americans’ retirement savings. The Social Security Act was drafted during President Franklin Delano Roosevelt’s administration as part of his response to the damage caused by the crash. The social welfare programs of the New Deal were the first time the federal government in the United States took action to provide assistance for the elderly. The Social Security Act itself was an attempt to limit what were seen as the dangers of modern American life in the Depression era, including old age, unemployment, and poverty, especially for widows and fatherless children. 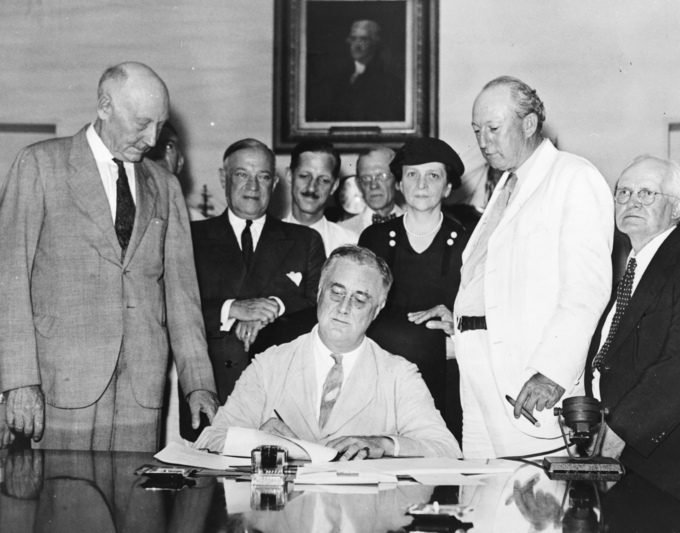 FDR Signs the Social Security Act: President Roosevelt signs the Social Security Act, at approximately 3:30 pm EST on August 14, 1935. Standing with Roosevelt are Rep. Robert Doughton (D-NC); unknown person in shadow; Sen. Robert Wagner (D-NY); Rep. John Dingell (D-MI); unknown man in bowtie; the Secretary of Labor, Frances Perkins; Sen. Pat Harrison (D-MS); and Rep. David Lewis (D-MD). Social security grew rapidly and is one of the largest government spending initiatives in the United States today. In 1937, OASDI had 53,236 beneficiaries and cost the federal government $1,278,000. In 2008, it had 50,898, 244 beneficiaries and cost the federal government $615,344,000,000. It is largely credited with significantly reducing poverty rates among the elderly. But how does social security work? Social security was designed to redistribute wealth temporarily to help seniors finance their lives post-retirement. The current workforce is taxed, the results of which flow into a special fund designed for social security. Payments are then made to retirees. This is not, however, simple redistribution, as the current workforce contributing to the fund will then retrieve payments once they retire. Thus, it is a cross between a redistribution system and a savings account. However, the structure of the social security system has put the entire program into serious financial distress. Currently, more money is being taken in by the fund through taxing the current workforce than is being paid out to retirees. However, this will soon change. If the laws governing social security are not changed by 2017, social security will pay out more funds than it takes in. According to analyses of the program, for about twenty years after 2017, the Social Security Trust Fund, or the amount of money that went into a special fund when there was a surplus in revenue, will make up the difference in payments. However, by 2037, the Social Security Trust Fund reserves will be exhausted and payments to beneficiaries will drop to about 75% of what they would have otherwise received. Intergenerational conflict refers to the conflict between older and younger generations as they compete for jobs and resources. According to the conflict perspective of aging, generations are competing over jobs. The inequities in resource distribution reflect larger disparities in power between generations. Whichever generation happens to be middle-aged at any given point in time is the most powerful compared to the old and the young. Members of the powerful generation act as gatekeepers for the distribution of resources and powers to be in line with their own interests. Power is therefore maintained by the middle-class, perpetuating their monopoly on resources. This perspective of aging derives from larger sociological conflict theory. conflict perspective of aging: According to the conflict perspective of aging, generations are competing over jobs. The theory developed in 1980s as unemployment rose dramatically. Intergenerational conflict plays a key role in the conflict perspective of aging. This social theory suggests that conflict between older and younger generations occurs as they compete for resources and jobs. The conflict perspective of aging is a strand of general sociological conflict theory, which is the theory that sees conflict as a normal aspect of social life rather than as an abnormal occurrence. At the Intersection of Generation: Conflict or Cooperation? : According to conflict theory, generations of people are in competition with one another for power and resources. Could this occur even at the micro-level? Conflict theory has three main premises: first, that society is comprised of different groups that compete for resources; second, that despite social attempts to portray a sense of cooperation, a continual power struggle exists between social groups as they pursue their own divergent and competing interests; third, social groups will use resources to their own advantage in pursuit of their own goals, even if it means taking advantage of another group of people. The conflict perspective of aging thus emphasizes competition between generations. According to the conflict perspective of aging, generations are competing over jobs. The theory developed in 1980s as unemployment rose dramatically. As jobs became increasingly scarce, younger and older generations both felt pressure to compete over available resources, enabling competition between the generational divide. As such, the economic climate of the era in which the theory developed influenced the content of the theory itself. The conflict perspective of aging is not solely about resource acquisition. Rather, resources stand for power. This perspective on aging maintains that whichever generation happens to be middle-aged at any given point in time is the most powerful compared to the old and the young. Members of the powerful generation act as gatekeepers and orchestrate the distribution of resources and powers to be in line with their own interests, often at the exclusion of the needs of other individuals and generations. Power is therefore maintained by the middle-class, perpetuating their monopoly on resources. This tension, and subsequent competition, is precisely what is addressed by the conflict perspective of aging.